November 11, 1919 was the first anniversary of the end of World War I. Originally this day was celebrated as ‘Armistice Day’ to honor all those who have served for the American military in World War I. It is both a state and federal holiday in the United States. In 1919, President Woodrow Wilson named it Armistice Day and in 1954, it was renamed as ‘Veterans Day’. Some people confuse Veterans Day and Memorial Day with each other but both of them are different. World War I officially ended on November 11th 1918. There are over 24 million veterans living today and 2 million of them are women. More than 400,000 members were killed during the war. In Alabama, The National Veterans Award was created in 1954. 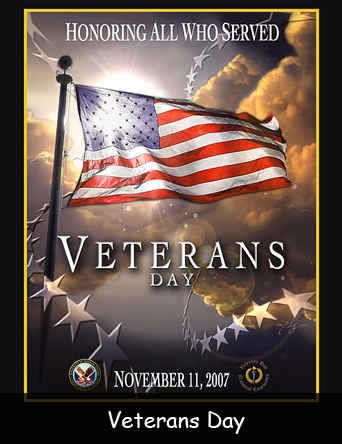 Veterans Day falls on the same day as Remembrance Day and Armistice Day in other countries. Every year, a ceremony is held in the Arlington Cemetery to honor all who have died in the war..
About 35% veterans living today served in the US military in the Vietnam War. California has the largest number of veterans out of all the 50 states. New York City holds the largest annual Veterans Day Parade with approximately 25,000 participants. Bill Clinton is the only American President who spoke at the official Veterans Day Ceremony every year of his presidency. From 1971 to 1977, this day was celebrated on the fourth Monday in October but in 1978, it took back its rightful date. National ceremonies of Veterans Day Center around the Tomb of the Unknowns. Congressman Ed Rees was the first person to receive the first National Veterans Award in 1954. Veterans Day became a national holiday in 1938. Declan, Tobin. " Fun Facts for Kids about Veterans Day ." Easy Science for Kids, Apr 2019. Web. 21 Apr 2019. < https://easyscienceforkids.com/veterans-day-facts/ >.